S2R Baton is the rechargeable version of the popular S2 Baton. While adopting the classical charging method of Olight - charging through the magnetic tailcap, it comes with a brand new designed portable magnetic USB charging cable, through which it can utilize the widely available USB power supplies, such as powerbanks and car chargers, laptops, etc. 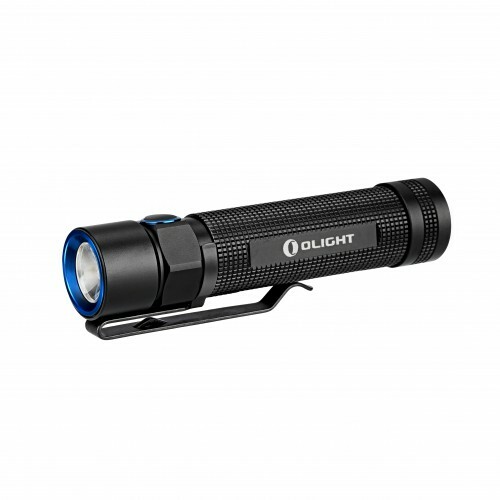 It uses Olight branded 3200mAh 18650 rechargeable batteries, delivering a maximum output of 1020 lumens. There will be no need to frequently change batteries for S2R Baton, thereby making it more cost-saving andbecoming an ideal illumination tool for home application. Quick access to turbo mode: Simply double click the side switch to enter. Light Form perfectly round spot , very wide. 1020 lumens - 2 min. 500 lumens - 190 min. 500 lumens - 200 min. 120 lumens - 13 h.
12 lumens - 120 h.
0.5 lumens - 60 days.